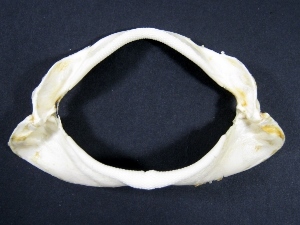 These are genuine, cleaned jaws from smooth hound sharks. The teeth are low and blunt, not sharp. The 3" jaws are 1.50" to 2" wide, and one weighs about 4 grams. The 4" to 5" jaws are 2.25" to 2.50" wide, and one weighs about 10 grams. Smooth hound sharks are not subject to CITES controls. Due to unknown species, for sale in Canada only. Not for export.